Click to Calculate Your Own Birth Chart! The inner rim of the chart wheel represents the circle of "mundane houses": each of the "spokes" delineates areas of specific environmental influences, called cusps (power points). The houses represent the sorts of circumstances you will have to deal with in this lifetime—challenges you have set yourself, so you may grow in personal understanding and consciousness. Each house is given a number from one to twelve, the first house cusp located at what would be nine o'clock on a clock-face, then, moving anti-clockwise as shown in the diagram on the right, numbering off around the chart. Cusps of houses in a chart do not usually coincide with the cusps of signs. The cusp, say, of the sign Aries is the first minute of the first degree of Aries, whereas the cusp of any house may be located at any degree and minute of any sign, depending upon the time and place of your birth. The cusps of the houses in your chart are indicated between the rims on the outer part of the wheel, with the degree in bold type, followed by the glyph of the appropriate sign, then the minute in normal type, while the number of the house is found at the innermost circle, near the centre of the chart. Ptolemy says the influence of the house begins to be felt 5° before the actual cusp. The angles of the chart are the strongest, most potent sectors. In most house systems these mark the beginnings of the first, tenth, seventh and fourth houses, in order of potency. Any planet in conjunction with an angle will have a marked influence that resonates throughout the chart and greatly colours its overall meaning. Planets located in the angles of the chart are the strongest and most significant. Because of their primary importance, the angles are often referred to as the cardinal points and they relate directly to the cardinal directions: east, south, west and north. The eleventh, second, eighth and fifth houses are called succedent ("following" the angles), while the third, twelfth, ninth and sixth are termed cadent ("falling away" from the angles). The succedents are next in strength. Planets in succedent houses function at around 50% of their power, based on the strength of an angular placement, which is the most potent. The cadent houses are traditionally held to be poor and of little efficacy. According to traditional astrology, planets in cadent houses only function at 25% of their power, compared with a position in one of the angles of the chart. The succedent houses follow the angles; the cadent houses come after the succedents. Note that 2nd and 8th houses, though succedent, are considered weak and unfortunate, so placed lower in the hierarchy of planetary support. The reasoning behind this is beyond the scope of this article, but experience bears it out. The first house is called the ascendant, or rising sign. This corresponds to the sign rising over the horizon at the time and place of your birth. The cusp of this house is the degree of the sign rising at the precise moment of your first breath. This sign sets the tone of your self-image: the way you see yourself. It also tends to have an effect on your appearance. The houses are often calculated in terms of the relationship between the ascendant and the mid-heaven (MC) – the highest point reached by the Sun on the day of your birth. The mid-heaven is usually the cusp of the tenth house, which represents the public life: how others see you. The paths of the planets through the houses in this way construct the circumstances of your daily life, between the public and the private perception. The method of calculating the other house cusps is also beyond the scope of this article, save to say that it is complex and that a number of house systems have been developed, the most widespread being Placidus, Koch and the Equal House System (if you do not already have your own birth chart to see how the houses affect you, please click here to calculate it with our free Chart Wizard). Others, such as Regiomontanus, Campanus, Porphyry etc., also have their dedicated adherents. 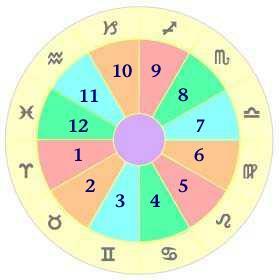 Vedic and Hellenistic astrologers generally use Whole Sign Houses. A contentious area of astrology, some modern astrologers have abandoned houses altogether, though this seems a little extreme. Remember that the houses, based on a twelvefold division of the heavens via the daily rotation of the Earth on its own axis, are not the same as the signs, which are based on a twelvefold division of the Zodiac, via the annual rotation of the Earth around the Sun.